Like Google Alerts on steroids, Trackle is a free service that delivers customized news and information. 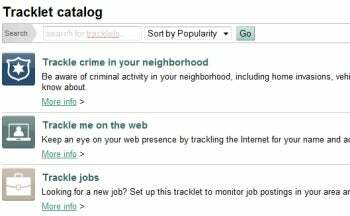 It culls the Web for just about any topic you can imagine, from crime reports for your neighborhood to low airfares for specific destinations to your own blog contributions and any resulting discussions. Just sign up for an account and choose the things you want to track. Trackle offers a couple dozen categories, starting with About Me: You on the Web, you in blogs, you in local news, and so on. Others include Finance, Health, Jobs, and Sports. For each "Tracklet" you set up, you simply supply a few extra bits of information to customize the results: names, keywords, locations, and so on. But this is effortless, and when you're done you can monitor the results in the Your inbox tab. Trackle can also send you an e-mail or text message when there's a new alert, either one at a time or as part of a daily digest. There's even a vacation-hold option that cleverly suspends notifications while you're on the road. I'm loving this service. It's much more versatile than Google Alerts, and the prefab Tracklets make it a snap to get all kinds of useful information. Definitely worth a look.